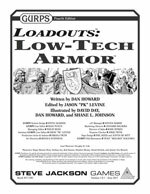 Whether you're playing a historical game or one of pure fantasy, GURPS Loadouts: Low-Tech Armor makes equipping your hero a snap – and helps the GM quickly armor hordes of nameless NPC warriors – all in a realistic and believable way. Spend less time poring over equipment lists and more time using that gear to prove your mettle on the battlefield! This supplement builds off the rules from GURPS Low-Tech and GURPS Low-Tech Companion 2: Weapons and Warriors. 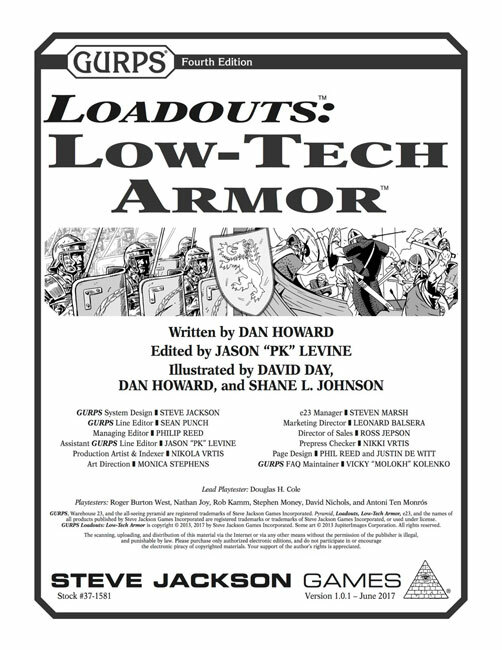 For additional pre-calculated protection, visit the armorers of GURPS Low-Tech: Instant Armor. The armor from this supplement can benefit many historical campaigns, including eras described in GURPS Crusades, GURPS Hot Spots: Constantinople, 527-1204 A.D., and Hot Spots: Renaissance Florence. Get a peek behind the curtain from author Dan Howard and a handful of loadouts from the New World, check out Pyramid #3/77: Combat.